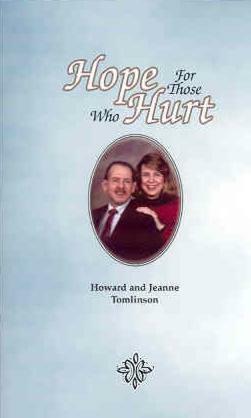 This book was privately published by Jeanne’s family after she died. While we were battling his brain tumor, Howie and I learned a valuable lesson on endurance from our nephew Matt, who recently completed Navy SEAL training. The SEALs are the military’s elite special forces. Training is so rigorous that the majority of recruits drop out. Matthew told us, “The philoso­phy of SEAL training is to break them down first, then build them up.” Trainees are brought to the end of themselves, especially during “hell week.” Only those who endure are inducted into the special forces. These servicemen have perfected the quality of “meekness,” strength under control and submission to authority, in order to survive the extreme rigors of warfare. We realized that SEAL training is similar to our Lord’s command to His followers: “Suffer hardship with me as a good soldier of Christ Jesus” (II Timothy 2:3). 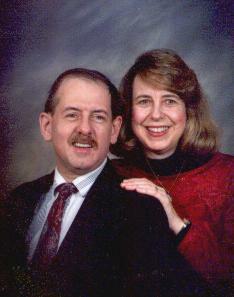 Years ago, my (Jeanne’s) father served as a Navy chaplain. Following his term in military service, he started youth clubs based on the Special Forces who fought in World War II. He established The Rangers and Christian Commandos in the 1950’s to train young people to be strong spiritual leaders. Many of the club’s activities, including Scripture memory and strenuous backpacking trips, were designed to help the members develop Christian character and endurance. While a teenager, I went on many Ranger backpacking trips. On one trip, we hiked 100 miles in two weeks in the high Sierra mountains of California. I’ll never forget the long days of backpacking with a heavy load on my back, climbing mountains, fording rivers, and taking turns to “stand watch” during the middle of the night. But it was worth it! I enjoyed God’s beautiful creation far from civilization, caught fish in a lake where no one else had fished, cooked over an open campfire, sang and studied God’s Word with my friends, and slept under the vast canopy of stars. I have many positive memories from the Rangers, and appreciate the experience I gained in enduring hardships without quitting, an ability I would definitely need in future years. 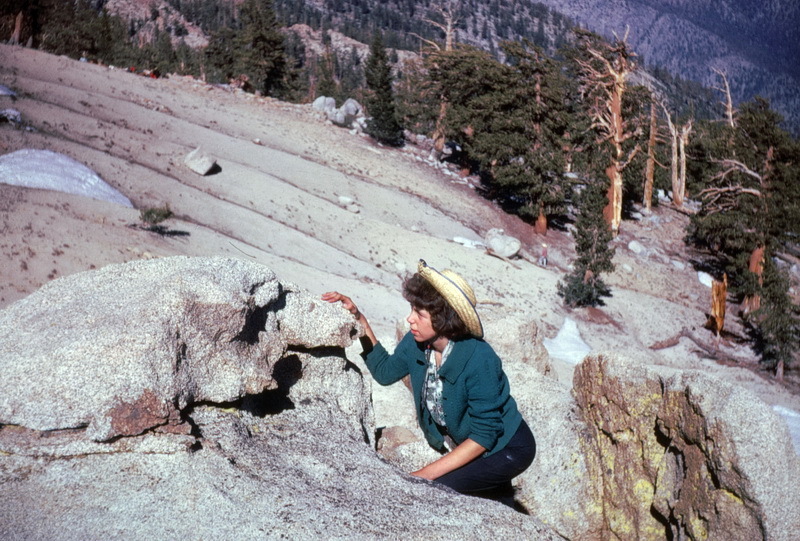 Jeanne struggles up the last mile to a set of Sierra lakes, 1962, on one of her father’s backcountry trips. It cannot be stated too often that the life of a Christian is warfare, an intense conflict, a lifelong contest. It is a battle fought against invisible foes who are ever alert and seeking to entrap, deceive, and ruin the souls of men. The Bible calls men to life, not a picnic or holiday. It is no pastime or pleasure excursion. It entails effort, wrestling, and struggling. It demands the putting out the full energy of the spirit in order to frustrate the foe and to come out, at last, more than a conqueror. It is no primrose path, no rose‑scented flirting. From start to finish, it is war. The Christian warrior is com-pelled from the hour he first draws his sword to “endure hardness, as a good soldier” (2 Tim. 2:3). God has His own special forces– the “heroes of faith” (Hebrews 11). Because of Satanic opposition, the world’s evil and our own sinful nature, God has called His people to take up the challenge and “fight the good fight of faith” (I Timothy 6:12) We are commanded to “put on the full armor of God” (Ephesians 6:10‑18), and “abstain from fleshly lusts, which wage war against the soul” (I Peter 2: 11). Many Christians, however, are spiritually flabby and unwilling or unable to engage the enemy. It is those who persevere through times of intense suffering who are the best qualified to heed our Lord’s call to fight. A preacher once said, “When God wants to use someone, He breaks that person first.” Like a broken horse, believers who are brought to the end of themselves learn to depend on the Lord and follow Him into battle. God’s favorites are men of faith like Joseph, Moses, Gideon, Job, David, Daniel, Peter, and Paul, who have devel­oped through suffering the qualities of submission and patient endurance. They are our examples of victors who receive the prize: “Be faithful unto death, and I will give you the crown of life” (Revelation 2: 10). In early 1993, Howie underwent his own version of “hell week” with the brain surgery, depression, and radiation therapy. He endured these hardships without losing heart by keeping his eyes on the Lord. Having been broken of self‑will and pride, he was now ready to be built up and trained as a member of God’s special forces. God had plans for Howie to learn to walk with Him by faith, submitting to his sovereign Commander and fighting wickedness with the spiritual weapons of prayer and Scripture memory. God broke him down to build him up and use Him for His glory. You may be overwhelmed by physical, mental, and spiritual battles, thinking “This is not what I bargained for when I came to the Lord.” Don’t lose heart! God may have plans for you that require strong discipline. “All discipline for the moment seems not to be joyful, but sorrowful; yet to those who have been trained by it, afterwards it yields the peaceful fruit of righteousness” (Hebrews 12: 11). He may even be using these trials to prepare you to be on the front lines in spiritual warfare. Look to Him as your Commander and submit to His training. Endure hardness as a good soldier of Christ Jesus, and allow Him to break you and mold you for His purposes. When you survive your “hell week,” you may find yourself a member of God’s honorable special forces, the “heroes of faith.” And if you persevere to the end, you’ll be able to proclaim victoriously with Paul, “I have fought the good fight, I have finished the course, I have kept the faith; in the future there is laid up for me the crown of righteousness, which the Lord, the righteous judge, will award to me on that day; and not only to me, but also to all who have loved His appearing” (II Timothy 4:7,8). *Footnote from the Editor: We plan to have this entire book back online this year. 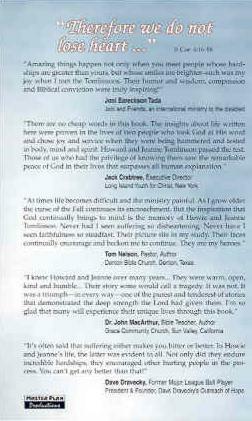 The book was endorsed by Joni Eareckson Tada (see image below) and others. Now that Joni is battling cancer, Jeanne’s family looks back with great appreciation for all that Joni did to encourage Jeanne in her trials, and prays for Joni to be free of pain as she awaits a glorious entrance into heaven – in God’s time, free at last from the wheelchair.